Cayey is known as "La Ciudad del Torito" (town of the little bull) and "La Ciudad de las Brumas" (city of the fog). Cayey was founded on August 17, 1773 by Juan Mata Vázquez, who became its first mayor. It is said that Cayey derives its name from the Taino Indian word for "a place of waters". Its original name was "Cayey de Muesas". Cayey territory is very mountainous because the city it is located on the Central Mountain range, north of Salinas and Guayama; south of Cidra and Caguas; east of Aibonito and Salinas; and west of San Lorenzo. Major rivers include: Guavate, Jajome, Maton, La Plata, and Grande de Loíza. The Carite Forest Reserve located between Cayey and Yabucoa offers more than 6,000 acres of protected parkland. Cayey is home of the Cayey University College (1967), a branch of the University of Puerto Rico. This is the only liberal arts college in Puerto Rico. 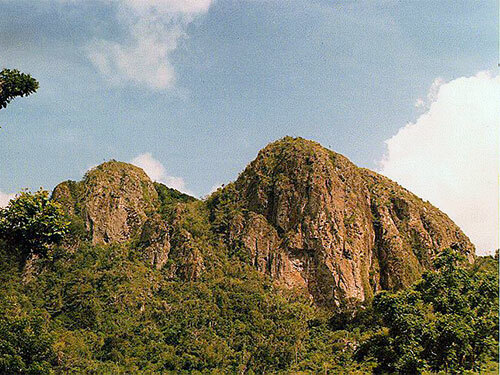 Cayey is famous for its two twin peaks known as "Las Tetas de Cayey," (the teats of Cayey), nicknamed for their similarity to a female body part, which were formed by volcanic activity. 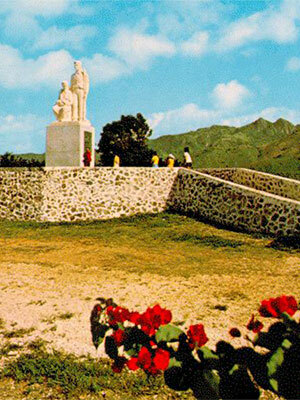 Another famous tourist attraction is the Monumento al Jíbaro Puertorriqueño, (Monument to the Puerto Rican Countryman) an homage to the Puerto Rican Jibaro, a humble, hardworking and wise man, living in poverty and with little or no education. The surrounding areas produces sugar, tobacco, and poultry. Cigars and clothing are also manufactured. Coca-Cola and Procter & Gamble have manufacturing facilities in Cayey. Want to know what to see and do in Cayey? Discover few ideas for exploring and enjoying the city. Every year, Cayey celebrates a patron saint festival. The festivities include dances, food, parades and religious processions. The flag derives its design and colors from the Coat of Arms, which is in the center of the flag encirled by a solid black ring. The centered Coat of Arms and has four triangles pointing to it, two white and two red. There are 22 public schools in Cayey, education is handled by the Puerto Rico Department of Education. Cayey is also home of 2 colleges and universities.